Here's a food fight that you'll be happy to get stuck into. Click here to play! There's spaghetti sticking to the walls, burgers across the floors and cream pies in faces! Finally, a game that pays you to toss around your favorite foods. 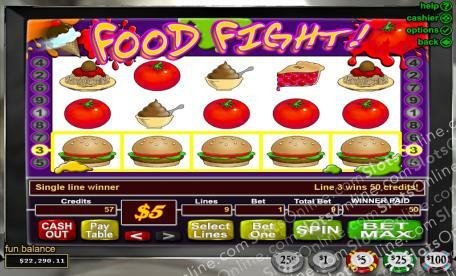 Get messy and get rich in this food fight! The key to winning this food fight is to choose the proper weapon. Manage to collect five puddings and you can win up to 6250 coins. Two to five plates of spaghetti will pay out up to 3500 coins. Cherry pies are nice and messy and will pay out up to 1250 if you can manage to spin five of them across a winning line! Pizza, tomatoes and burgers will get you some decent cash as well, so be sure not to overlook those. Cream pies have to be a food fight favorite, and if you can put one together on the reels, you'll trigger a bonus game that will see you putting pies in faces for cash! Ice cream is there too. Assemble a cone or two for a chance at extra coins in your account. How often will you get the chance to make money for a food fight? Win in this food fight and you'll walk away with a satisfied smile and an account full of money. Three sections of an ice cream cone act as a scatter symbol. If you can spin the three sections from left to right, you'll win bonus coins. You're looking for the cream pie! If you can manage to spin all three sections of the cream pie from left to right, you will trigger a bonus game. It's a Pick n' Pop style game in which you will pick a character to throw a cream pie at. If you hit them, you will be rewarded with bonus cash. You keep picking until you miss.